Now Facebook users can Earn Money Online by just watching Ads on the Facebook website. Last Thursday Facebook has introduced a new program that allows users and consumers to earn financial incentive by just watching facebook ads. Facebook will now reward their users who watch certain ads on the website with Facebook Credits, which can be redeemed to purchase goods on Facebook Deals, the company's new Groupon like daily deals service. The incentive amount, however, is not huge. Initially at least, the average ad will yield one credit, which is the equivalent of 10 Cents. Facebook's move represents "a step away from interruptive advertising." Greenberg, whose clients include Microsoft and Nestle, says his network won't deliver traditional advertising, but rather branded entertainment, which consumers will want to not only watch, but share with their friends. 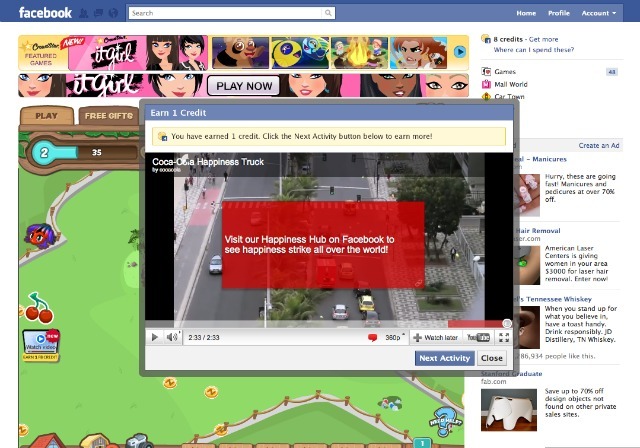 Incentivizing consumers to watch ads is one solution for Facebook's low banner click-through rates. The move comes after Facebook expanded its Credits program last week to let consumers use the Credits to buy real-world goods advertised in Deals.